RX 580 2048SP has caused a lot of attention recently. Dylan, Sapphire and XFX have launched corresponding products. But after all, it is just a “vest card”, and it will continue to sell itself. The next step in AMD graphics is naturally the new core of the 7nm process, and even the new architecture, but the distance is still far away, and there are not many tricks to play at the moment. There have been rumors that AMD will improve the existing Polaris architecture, the core of the RX 580 will be upgraded to the 12nm process, performance can be improved by about 10%, and according to the latest, this new card will be called RX 590. Prior to this, ASUS, HIS (HIS) RX 590 have appeared, 3DMark database also appeared, the core frequency increased to 1545MHz, the performance is indeed about 10% higher than the RX 580. 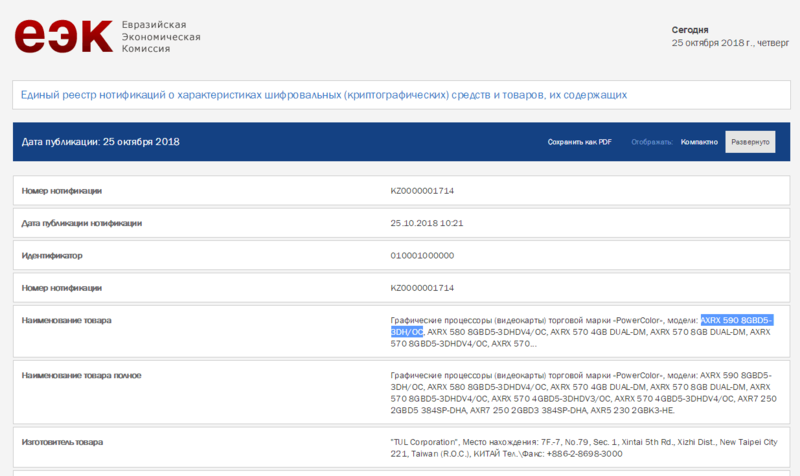 Now, the Eurasian Economic Union (EEU) product certification list RX 590, model number ” AXRX 590 8GBD5-3DH/OC “, according to Dylan’s naming rules, the more popular saying will be RX 590 Red Devil 8GB GDDR5 , which is the high-end version of the Red Devils. In addition to continuing to match 8GB GDDR5 memory, other specifications are not clear, but it depends on how much the frequency can be improved. Looking at this situation, the RX 590 is expected to be officially released in the next few weeks.